Bibliography: KaT. TMHH 1948, p. 63; KaT. FMHH 1957, p. 113; KaT. FMHH 1961, p. 151; G. Bellori, Le Vite del pittori, scultori ed architetti moderni, Rome, 1672, p. 411';- Florent Le Comte, Cabinet de? singularites d'architecture, peinture et sculpture, 2nd ed., vol. 3, Paris, 1702, p. 24; F. Baldinucci, Dalle Noti-zie dei professori del dissgno, vol. 16, Florence, 1767—74, p. 99; Cat. Ermitage 1774, No 908; Notice sur PErmitage 1828, p. 70; Smith 1837, No 36; Cat. Ermitage 1863, No 1396; Waagen 1864, p. 282; COMOB 1900, No 1395; Friedlaender 1914, pp. 23, 112; Grau-toff 1914, vol. I, p. 65; ibid., vol. II, No 5; Magne 1914, p. 205, No 139; KaT. SpMHTaaa 1916, No 1396; Ernst 1928, p. 164; Reau 1929, No 277; L. Hourticq, La jeunesse dv Poussin, Paris, 1937, p. 153; S.-Ch. 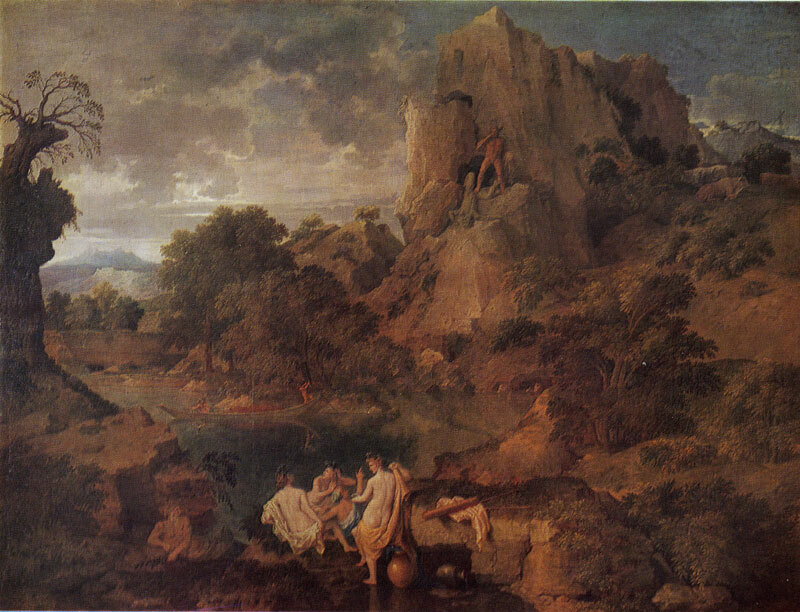 Emmerling, Antikenanwendung uni Antikenstudium bei Nicolas Poussin, Wurzburg, 1939, pp. 27, 76, ill.; F. Licht, Die Entwicklung der Landschaft in den Werken von Nicolas Poussin, Basle — Stuttgart, 1954; Sterling 1957, p. 29; A. Blunt, La Premiere periode romaine de Poussin, in: Actes du Colloque Poussin, vol. 1, Paris, I960, pp. 166, 168, 169, 171, 174; A. Blunt, Ch. Sterling, Exposition Nicolas Poussin, Paris, 1960, p. 42, No 3; F. Parisot, Les Natures mortes chez Poussin, in: Actes du Colloque Poussin, vol. 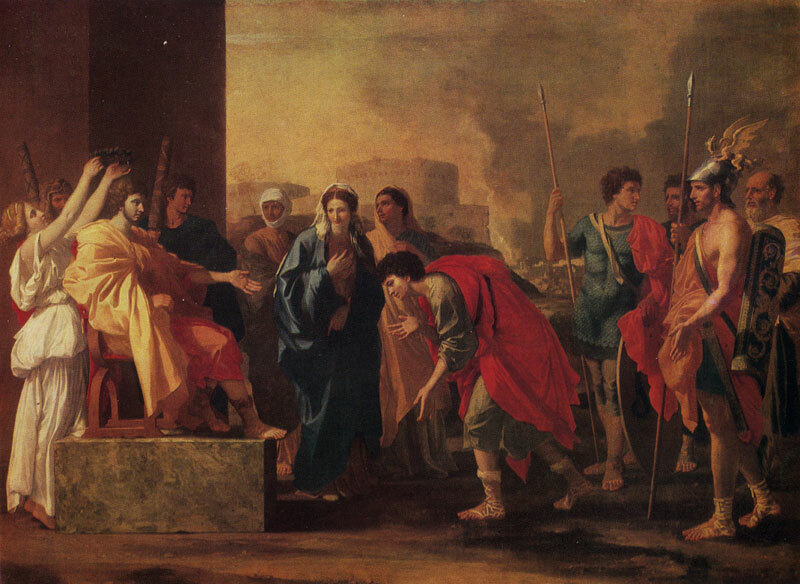 1, Paris, 1960, p. 217; J. Thuillier, Premiers compagnons francais de Poussin a Rome, in: Actes du Collogue Poussin, vol. 2, Paris, 1960, p. 75; FIpoKocpheB 1962, ill. 16; Musee de Moscou 1963, p. 134, ill.; Blunt 1967, p. 65, ill. 4; Thuillier 1974, No 12, ill.
Oil on canvas. 95 X 133 cm. Inv. No 2762 The subject is taken from Torquato Tasso's Jerusalem Delivered (XIV). O. Grautoff and A. Blunt date the picture to 1630—35, J. Thuillier to 1625—26, taking it to be one of Poussin's first works on a secular subject. 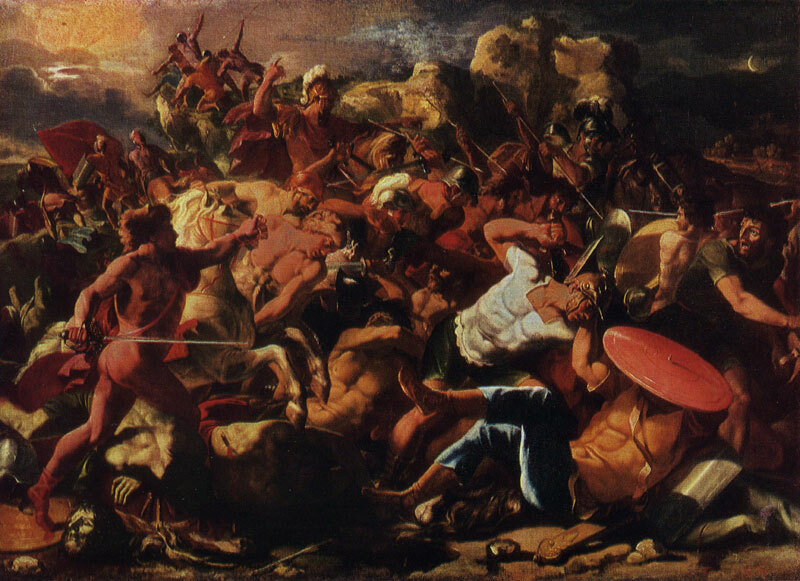 A picture on a similar subject is known to have been executed by Poussin for his friend, the painter Jacques Stella. The Moscow painting is probably its replica. A later copy was in the Kaiser-Fried-rich-Museum in Berlin until 1914. Among the numerous variants on this theme the one now in the Dul-wich College Gallery (England) is best-known. The picture was etched with a needle by J. Sanders (1809) and by A. Reveil (1829). Oil on canvas. 114.5 X 163.5 cm. Inv. No 1048 The subject is taken from Livy's work Ab urbe con-dita (XXVI : 50). 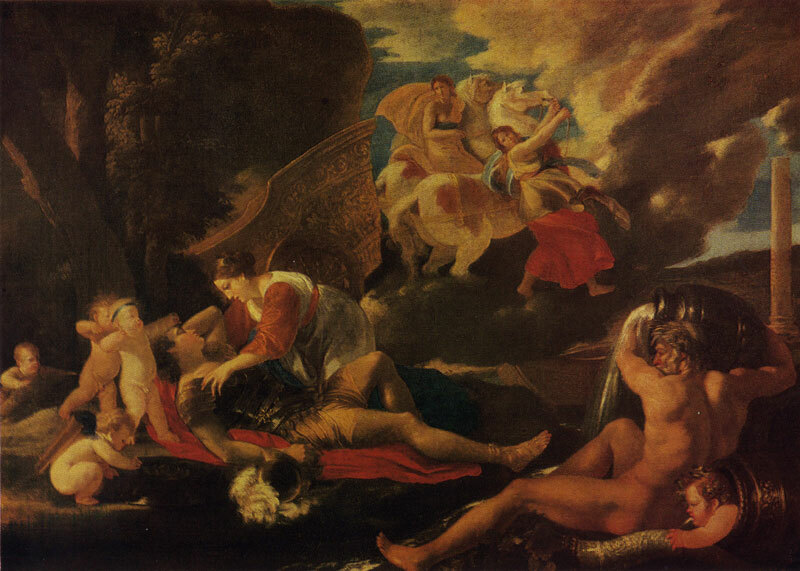 The picture was painted in the 1640s after Poussin's return to Rome. A copy by J. Smibert, executed in the early 1720s, is in the Bowdoin College Museum in Brunswick (USA). A preliminary drawing for the picture is in the Musee Conde at Chantilly (No 185 bis). Oil on canvas. 156 X 202 cm. Inv. No 2763 The subject is taken from Virgil's Aeneid (VIII). The picture was considered to be a pendant to Landscape with Polyphemus (The Hermitage, Inv. No 1186), but judging by the manner of its execution, it belongs to a later period. A. Blunt and D. Mahon date it to 1659-61.